I am writing this from Japan to find out whether you have any information on Japanese travelers in 1884. Or who might have such information. I am studying our local hero who was described as "A Living God" in Lafcadio Hearn's book published in 1897. Based on the limited information available for his trip to the U.S., he left California on October 20, 1884 and met some representatives from the Mormon church ... in Salt Lake City on Oct. 22. He continued traveling to New York via Omaha, Chicago and Niagara. Unfortunately, he died on April 21, 1885 in New York City. He was Goryo (or Gihei) Hamaguchi and the seventh president of Yamasa Corporation (Japanese soy sauce manufacture). He saved many villagers from a big Tsunami in 1854 by setting fire to rice sheaves. He also established a school for the village in 1852 and served for the country as a minister of postal and telecommunication. 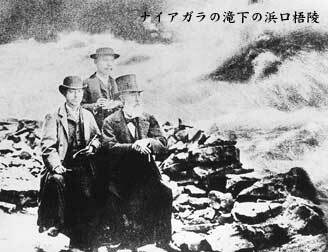 Here is a picture of him at the Niagara Falls with his company.